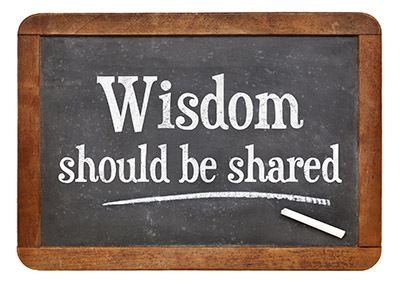 A couple of months ago, we asked APERS retirees to “Share Their Wisdom” – specifically, “if given the chance, what advice would you give yourself 20 years ago about better preparing yourself for retirement?” Hopefully our active members can learn a thing or two about improving their own retirement futures from this hindsight. Below is a small set of the anonymous submissons we received on the ‘Share Your Wisdom’ survey. We’ll post more responses in the near future. (By the way, all responses are the opinions of the individuals responding. APERS does not endorse any of the suggestions made in the responses, nor do we make any recommendations about members’ investments, finances, or private retirement plans.) Enjoy! 1. Have an end point in mind – how long do you want to work, and what age at retirement. An exit strategy, if you will, so that after that point you will work only if you want to. For me, I knew I wanted to work at least 35 years. That was my goal and I stuck with it. 2. Begin NOW (!!!) putting money into a Deferred Comp account offered through the state. I started late – age 43 – and contributed only 17 years. I really wish I’d started earlier. Set a percentage of gross income as your goal to contribute – try at least 5% and increase when you can. You’ll be amazed how little you miss it and how fast it grows. Main thing: START NOW!!! JUST DO IT! 3. At 5-10 years out from retirement, use APERS resources to help you determine if you want to DROP or PAW or neither. You’ll need to plan that income modifier into your long-term retirement plan. I used DROP and didn’t regret it, but colleagues used PAW and were quite pleased. Plan to fit your particular situation. I hope this helps. With a little sacrifice, I was able to retire at age 60. You’ll be there quicker than you think. You learn to live on what you make, so each time you get a raise – cost of living, performance appraisal, upgrade, whatever – invest the amount of the raise in deferred comp and continue to live on what you are used to. This money multiplies much faster than you would think and will help support your APERS retirement when the time comes. I would tell myself that you shouldn't retire until you know your monthly retirement income will be sufficient. Just knowing you will get a pension isn't enough. Your expenses (unless you downsize) will remain at the same level as when you were working. Downsize first, then retire. Beware of buying annuities: your agent may tell you that you can make withdrawals if you want to pay the surrender charge, but there are higher interest annuities out there that don't allow withdrawals. I would also make sure your spouse understands what a reduced income means and doesn't keep spending like you were on full salary. I would do the DROP in Arkansas now they let you come back to work. I didn't because at the time I retired, if you had been in the DROP, you could not come back to work for the State. Do not retire unless you have a life outside of work!!! I wish I had worked the whole 28 years!!!! First, I wish I had started Arkansas Diamond* much earlier than I did. What I started with was the minimum and gave a portion of my raises whenever I got one. It’s still a pretty good amount after all these years, but for a few dollars more it would have been awesome! Secondly, I wish I had contributed earlier into Arkansas Diamond Roth instead of pre-tax. I would like to have more tax free money right after retirement to go debt free with. Now if I pull out too much the first year, I will put myself in a higher tax bracket. *Note: Arka nsas Diamond Deferred Compensation Plan is a tax-deferred retirement savings/investment plan available to employees of Arkansas state, county, municipal, and other political subdivisions. For more information, visit the plan website. Click here to register online for one of our upcoming retirement seminars. Here you will find information based on your role in our system, whether you are an active member, near retirement, a retired member or an APERS particpating employer.